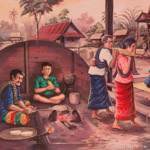 These twelve heet ("traditions" or "rituals" that help you have a good life) are practiced across Northeast Thailand (the region known as Isan) and lowland Laos. City folk have mostly abandoned some of them, but there are very few Isan villages where they don't all remain important events. Some are Buddhist celebrations observed around the globe while others originated from local pre-Buddhist beliefs, though all of the later now have some Buddhist aspect as a part of them. Usually the Buddhist portions includes making special donations to monks and listening to a standard Thai Buddhist suat-mon chanting and prayer session. These traditions are not only essential to one's life and afterlife, they're also important for community bonding. Nearly everyone in the community works together to prepare for them. 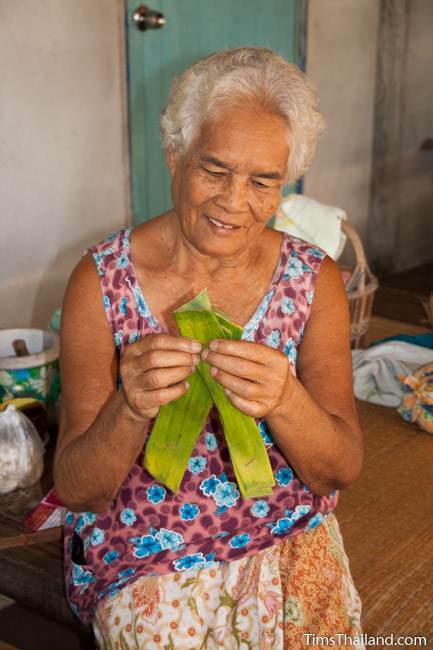 Note that the descriptions here explain typical activities, but celebrations can vary considerably place to place and many villages have changed or eliminated some of the specific activities and others have added their own personal touches. Each lunar month (which runs from new moon to new moon) has its own heet. Though the months are numbered, there's no actual first heet: it's a cycle, not a progression. The first lunar month typically falls in December. Though the lunar calendar obviously does not line up with the solar year, every few years a leap month is added to keep things generally in sync. My goal is to attend all twelve ceremonies to write a photo essay about each. I'll add the links to this page as I do them. 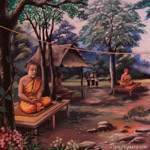 During the time of Boon Khao Kam, monks who broke vinaya rules (the rules of monkhood that were laid down by the Buddha) will do penance and spend time in solitude for purification. 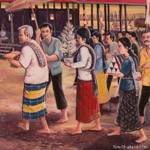 Lay people take extra food and supplies to the temple at this time to support these monks during their atonement. Boon Khun Lan, one of the most important annual village rituals, is a celebration of the rice harvest and a thank you to the spirits who helped. A large pile of unhusked rice is blessed and donated to the monks and then there are ceremonies to honor the spirits of the village's rice granaries, paddies, and Mae Phosop, the rice goddess. A very common Isan food, khao jee is grilled sticky rice battered with egg. 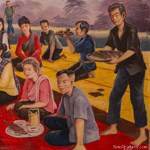 During the Boon Khao Jee celebration, people get up early to grill them for the monks' morning meal. The tradition stems from a story about the Buddha eating a humble rice cracker given by a very poor woman. In his final earthly life before reaching enlightenment, the Buddha was born as Prince Vessantara (aka "Pha Wet") and he gave away everything he owned, including his wife and children. 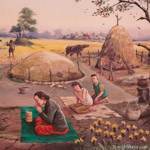 Boon Pha Wet is a celebration of his perfect generosity. On the first day, the family's reunification is reenacted and a long scroll with the story painted on it is paraded around. The next day people listen to monks read the entire story, which generates considerable merit towards the possibility of rebirth in the era of Maitreya, the next Buddha. Songkran is the Thai New Year, and it's the most important holiday in Thailand. The best known aspect is people splashing water on each other, both for fun and to wash away all things negative, which is why it's often called the "Water Festival" in English. But many solemn activities during Songkran center on paying respect to elders. Known as the Rocket Festival in English, Boon Bang Fai is one of the iconic elements of Isan culture. 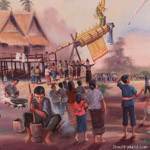 This boisterous festival takes place around the start of the rainy season and people launch giant homemade rockets to remind Phaya Taen, the sky god, that it is time for him to begin sending the rain. As the present version of the rocket festival has its origin in pre-Buddhist fertility rites, there's a lot of overtly sexual shenanigans like cross-dressing and giant phalluses during the duration. 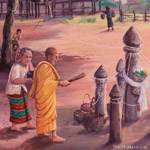 Phansa is the three-month Buddhist Rains Retreat, when monks remain at one temple. Many use this time for intense dharma study or meditation practice while lay people are encouraged to be extra devout in following the Buddhist precepts, which is why the Rains Retreat is often called the "Buddhist Lent" in English. Khao Phansa is the first day of the Rains Retreat and people bring candles to the temple, and in many towns there are parades of large, decorative candles or wax sculptures. 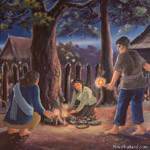 It is believed that spirits are able to roam around earth at this particular time of year, and Khao Pradap Din is a ceremony for people to honor their visiting ancestor spirits with a feast of food, usually laid out on the ground at the temple. Wandering spirits are also treated to food. 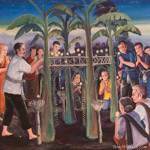 Boon Khao Sak is the follow-up to the Khao Pradap Din ceremony from the previous month. It's the time to say farewell to the ancestor spirits with another feast. As part of the morning donation at the temple, the monks and novices draw lots to see whose food trays they get. 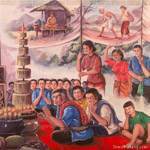 Ok Phansa is the end of Buddhist Rains Retreat, aka Buddhist Lent. In the daytime people listen to sermons and then during the evening people light candles or oil lamps – these are usually most impressive along the Mekong and other rivers which display the lights on large bamboo rafts. 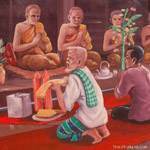 Kathin is a ceremony to offer new robes to monks and it is celebrated nationwide, not only in Isan. Communities lead large processions to make the donations at their local temple, and when this is done most towns arrange other community activities such as boat racing.